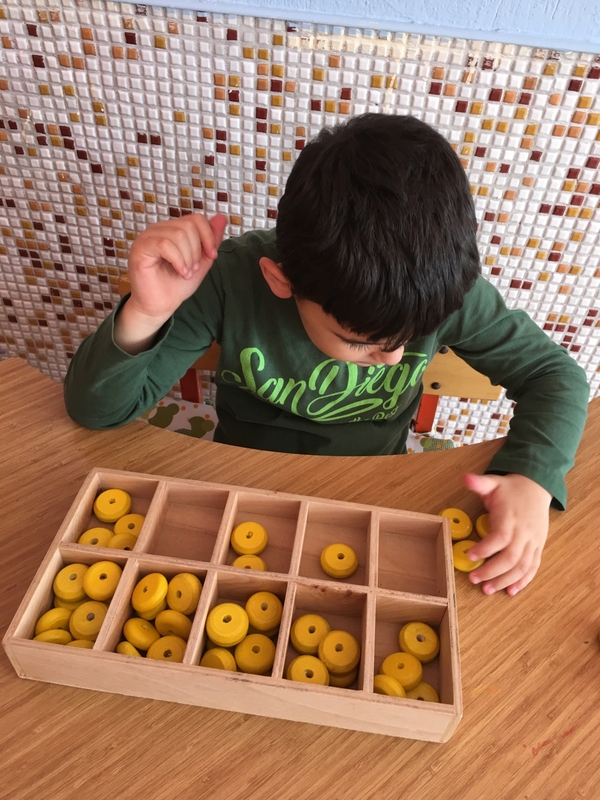 The formation of numbers in a meaningful way in the mind and the provision / reinforcement of permanent learning in each figure. 10 partitioned (bottomed 5'er) material is prepared from wood or durable card with the numbers written on each partition in order (from 0 to 9). Wood beads (preferably all one color) are provided in sufficient quantities to match each figure. The teacher shows the place of each figure in the wooden partition and puts the wooden bonnet in the partition. The pupil tells you to do the same thing. This is done for each figure. Thus, the teaching of numbers is reinforced. 0 is left blank for the number and is recognized as 'no, empty'. Teaching is repeated until full learning is achieved. A teacher is enough in teaching. Education is carried out on an individual and a class basis. Wooden figure written and divided box, at least 45 piece beads consisting of a single color of wood. Attention should be paid to the level of readiness of the student, and each figure must have been comprehended beforehand. This application is for reinforcement purposes. Please enter the URL for the good practice at your school or any other internet place. If you don’t have a specific URL for your practice, then enter the URL of your school.